I know what it’s like to wake up in the morning ready to seize the day. I get dressed and have my coffee thinking today is going to be a great day. I have plans with friends that I haven’t seen in a while and have been really looking forward to getting out of the house. Everything is going great until my body decides it doesn’t want to cooperate. I guess it didn’t get the memo that I want to have a good day and forget any aches and pains. Instead, my skin is acting up and I’m starting to feel that old familiar, and very uncomfortable, itch. If you suffer from eczema, you know the kind of itch I’m talking about. The annoying, can’t-think-of-anything-else urge to just scratch and scratch. It seems almost impossible to focus on anything else including catching up with good friends in a relaxing environment. I think people would look at me funny if I indulged in my desire to ease the itch pain by giving it a good scratch. Plus, that would make it worse, right? At least, that’s what my mom always said. Don’t scratch! 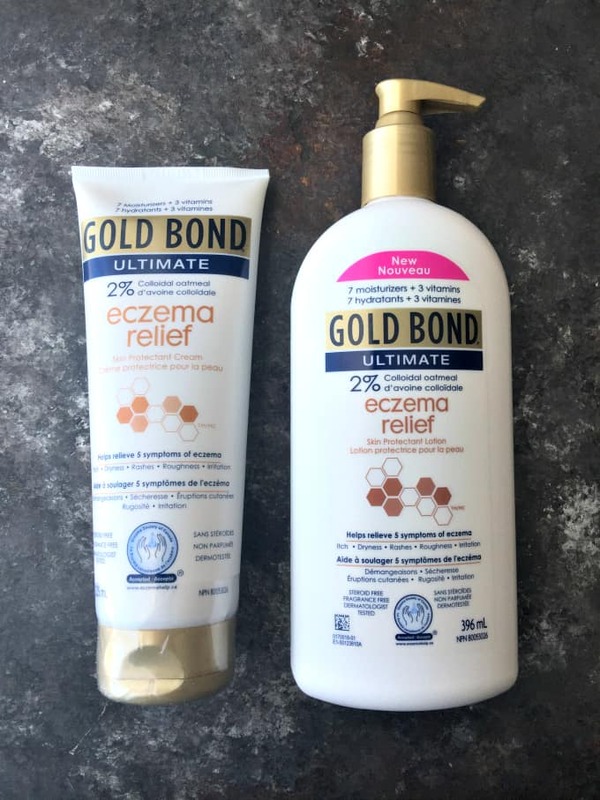 The good news is that you can ditch the itch with Gold Bond Ultimate Eczema Cream and Lotion and be comfortable in your own skin. These products work to help relieve the annoying and uncomfortable symptoms of eczema like itching, dryness, rashes, roughness and irritation. Simply apply the cream or lotion to the affected area and it will work to relieve, soothe and protect your skin. When my skin is flaring up, Gold Bond is the brand I turn to. They are backed by 100 years of scientific research and have proven results. 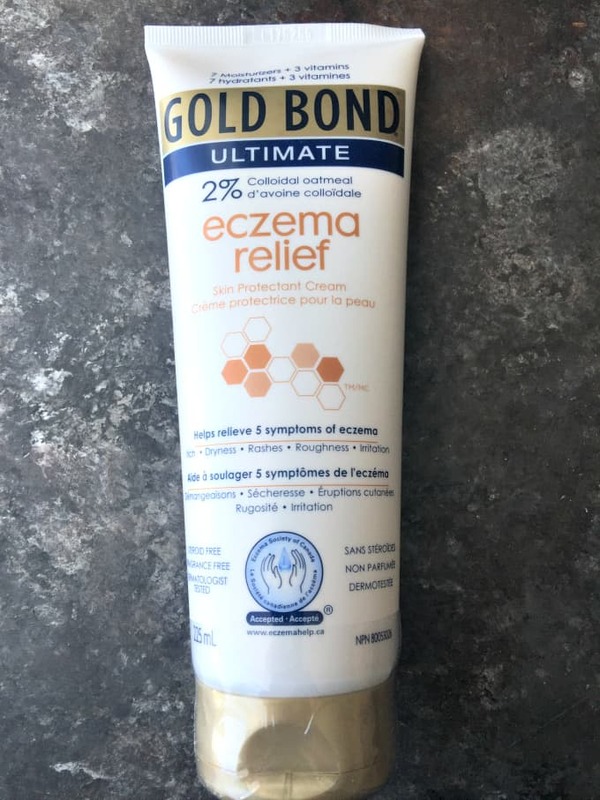 Gold Bond Ultimate Eczema Cream and Lotion contains 2x more colloidal oatmeal than other over the counter eczema brands. It’s also steroid free, dermatologist tested, fragrance free and hypoallergenic. You can pick them up at most major drugstores across Canada. The cream retails for $13.99 while the lotion retails for $18.99. They are a must-have if you suffer from eczema! 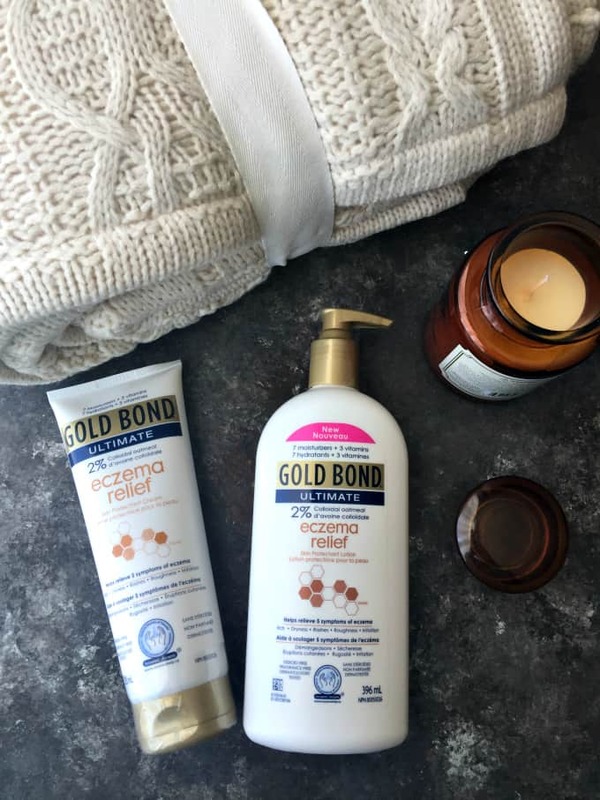 Pick up some Gold Bond Ultimate Eczema Cream and Lotion so you can enjoy your day! I like to live in the moment and focus on the people I care about and NOT on how my skin feels. Disclosure: This is a sponsored post. All opinions expressed on this blog are my own. This Gold Bond itch reliever is something we all need at one time or another. I have never tried it and don’t have eczema but my kids do so I will get this for them and stop all the complaining. I get such bad dry skin and sometimes it seems like an endless battle. I’ve never tried Gold Bond though. I’ll have to go get some! I have never used this brand lotion before. It sounds really nice especially for our Florida humid, dry weather. I love GOld Bond! I get really dry itchy skin in the winter and it’s the only brand that helps me! Perfect timing! i actually suffer from this condition and was wondering of a new lotion to ease the dry, red itchy skin. First… totally in love with your cable knit blanket! Now… I have the driest skin ever. I can’t believe I’ve never used Gold Bond before. That’s sure going to change! I love gold bond. At work I wash hands 50 times a day and in winter they are always so dry . I always try to use a great brand like gold bond. Every year when it’s cold, my skin itches! I’ve never used Gold Bond, but I will pick it up and try! 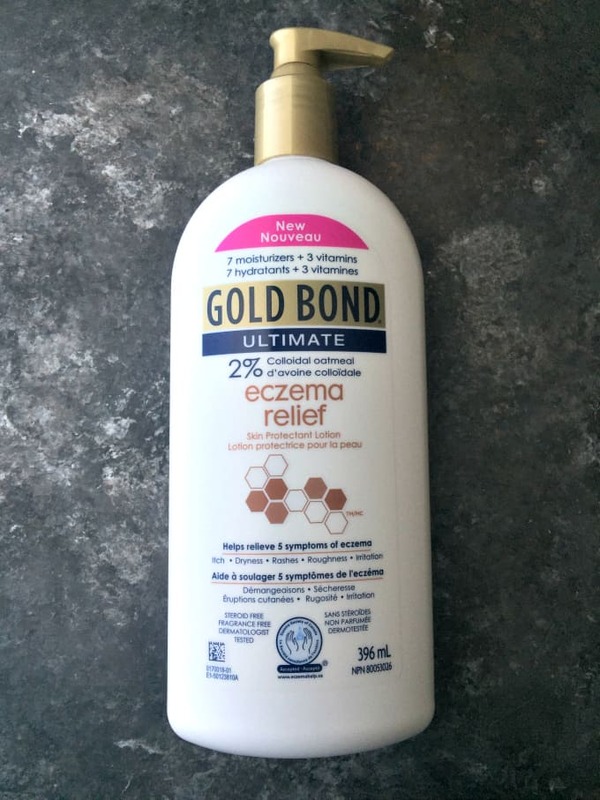 I don’t have eczema, but have used Gold Bond products in the past and they were always winners! Especially during this time of year when my skin is so incredibly dry! We saw the Gold Bond exema cream at Walgreens and almost bought some. I didn’t know if it worked as well as the other brand we’ve relied on. Thank you! I’ll grab it next time. Gold Bond has been a brand I have always trusted. I didn’t know they had a lotion specialized for eczema.